I took this shot of Anya a couple of weeks ago when she became obsessed with these BIG GREEN HANDS! she found in the toy bin. They come with a Velcro ball to take the challenge out of catch... as though that's the big problem plaguing our youth. She had no interest in the ball, but screamed and shook her head when I attempted to remove them from her so she could eat brunch with the family. Finally we distracted her enough and she became hungry enough that she was willing to move on with her life without them. Sigh. 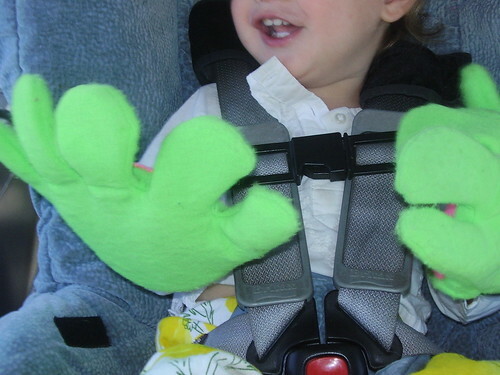 BIG GREEN HANDS!, we love that you charmed our baby. We promise to allow you to play soon. Although I can't promise I can find the Velcro ball. Sorry.